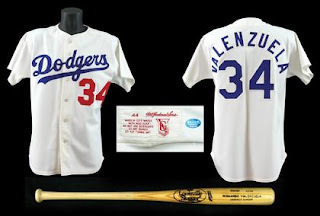 Here are some goodies from Mastro's recently closed auction; including a jersey that makes me want to cringe. Why bother buying packs of cards searching for "big hits" when you can make your own? 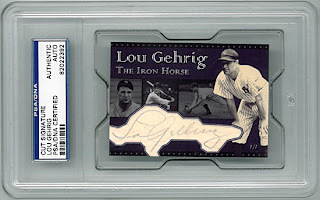 Here is a custom homemade card featuring a authentic cut signature of Lou Gehrig. I've seen these before on the internet and am always amazed how great these custom cards look compared to today's cards found in boxes. This particular card sold for $2,100.00. 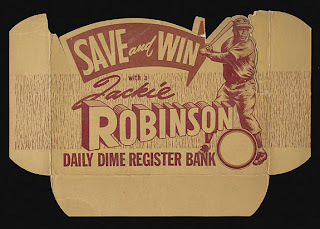 This is the first time I've seen a store display box flap for the 1950's Jackie Robinson dime bank. I would be surprised if any more existed. It sold for $275.00. 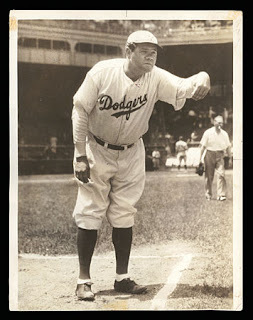 Can you ever get enough of Babe Ruth in a Dodger uniform? It sold for $225.00. Someone must be able to figure out who this guy is. 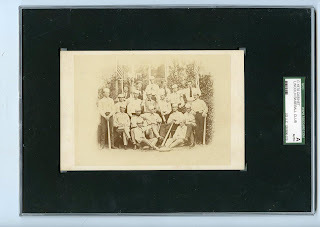 Below is a unknown Brooklyn Dodger cabinet photo from the late 19th century. It sold for $500.00. Must burn this now! This is a work of Dr. Frankenstein. 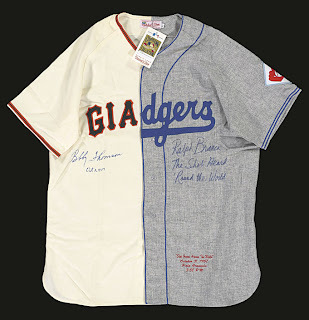 Below is a split jersey of the Dodgers and Giants featuring autographs of Ralph Branca and Bobby Thompson of "The Shot Heard Round The World" fame. In this lot you also get a signed bat, ball and photo. It sold for $225.00. After 4 offers from the Dodgers, Boras finally decides to make a counteroffer to the Dodgers. It took long enough didn't it. Scott Boras made a counter offer using the same basic language and numbers of the club's two-year, $45MM offer, but without the deferred payments. Boras told the Dodgers that they have until noon to strike a deal. I don't blame McCourt and company for the last offer with deferred payments. After all, the framework of a $45MM deal over two years is the most important ingredient. The deferred payments is just a ploy to finally get Boras to make a commitment because, at this point so far, Manny and Boras have refused to negotiate in good faith. When one side refuses to formally counter several other offers (especially good offers) how can the offeror be expected to continue to bid against themselves? This entire process is a negotiation that requires that both sides work together to hammer out a deal. One side, the Dodgers, in my mind, has gone above and beyond in their duties in this negotiation. They have made 4 offers! It is incumbent on the offeree to come back with a counter. Apparently, Boras finally has. And now, we have the makings of a potential deal. (It took longer than desired to get Boras off his perch) Nevertheless, it is now time to get it done. Update: I wanted to add that you shouldn't expect a done deal until this weekend at the earliest- probably early next week. Boras's deadline for noon today is irrelevant. Another Hunt Auction, More Dodger Goodies. "Having a wonderful time at Bowman's. There's never a dull moment when the Dodgers are playing baseball." This is the perfect gift for a child spending the afternoon with Dad at the ball game in Ebbetts Field. Below is a circa 1950's doll measuring 8 inches tall. It sold for a affordable $50.00. 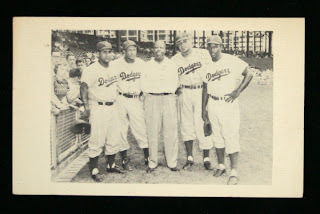 This is the ultimate vintage Dodger photo scrapbook. 60 autographs are featured in this 1950's Montreal Royals album with many of them having corresponding photos attached. I would love to see all of the other pages. It's a treasure trove. Includes Al Giofriddo, Bobby Morgan, Bert Haas, Don Thompson, Carman Mauro, Shotgum Shuba, Tom Lasorda, Dan Bankhead, Clyde King, Jim Hughes, John Podres, Walt Alston, Chuck Connors (yes the actor), Jim Gilliam, Duke Snider, and others. It sold for a healthy $440.00. 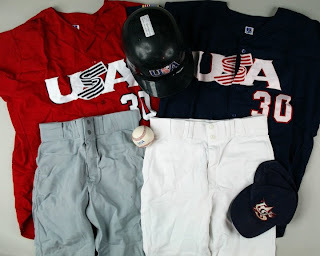 Here are 2 pairs of game worn jerseys and pants, a batting helmet, cap and game ball of Dodger hurler Chad Billingsley. He wore our colors during the 2002 IBAF World Junior Championships and won a bronze meal. He won 3 games and lost none with a 2.45 ERA. It sold for $201.00. Here is a great well worn Jackie Robinson pennant from the 1950's. How did this thing ever survive without being colored in? Below is a unused vintage Dodgers coloring book from the 1960's. 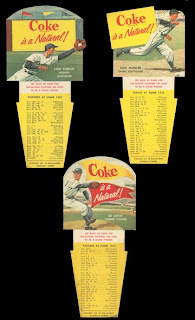 It has 12 pages and features players like Sandy Koufax, Don Drysdale and Maury Wills. 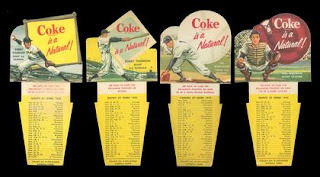 It originally sold at stadium souvenir stands for 60 cents. Baseball America just released their list of 100 top prospects and the Dodgers only have 2 representatives. At #49 is Andrew Lambo and at #56 is James McDonald. It appears that Chris Withrow and Ivan DeJesus, Jr. have been overlooked. Is Manny geting closer to wearing Blue this year? 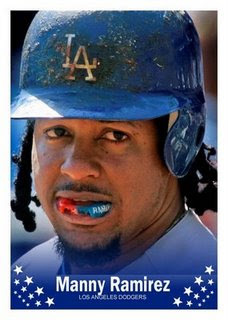 MLB Trade Rumors has a great rundown on the Manny Ramirez sweepstakes. Check them out here. Check out Roy Campanella hitting a home run. Russell Martin's growth can be seen through his growing pains. While struggling with the workload a young catcher must endure, Joe Torre gave him the straight scoop. "Baseball is like this," he (Joe Torre) says, moving his hand steadily. "You need to get rid of this." Now the hand is making a sine wave, with peaks and troughs. "We play every single day. You have to stay here emotionally" — the steady hand again. Still, Russell struggled with his emotions. "I'd just get pissed. It wouldn't be consistent. Some days I'd be having good days and I'd be like, okay, this is fun. And some days I'd miss my pitch or make an error and I'm pissed, and the pitcher's wondering what's going on. The goal is to stay as smooth as I can. The goal is to help, that's what I'm here for, really." At least he's getting some help to reach an even keel with the help of a certain lady friend. He's settled down with a steady girlfriend, and while babies aren't in the picture, "We are practising a lot," he says, smiling. Check out the entire article here from The Globe and Mail. Are you sick of the whole ARod thing too? FallingLEAVes of Sunshine shares her pics from the Dodger caravan here and here; then she shares her autograph scrapbook. Nice collection! Jo Anna does the Dodger Stadium tour. She took plenty of pics 1, 2, 3, 4, 5. 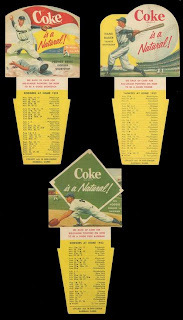 The Topps Archive matches up the backgrounds of the 1955 Topps Doubleheader Set. Check them out here. 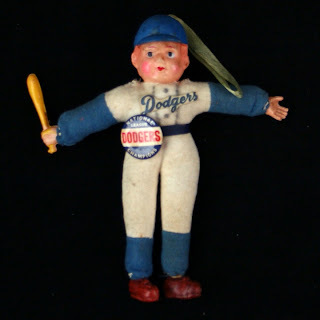 Say hello to this new Dodger blog: Dodgers Blue Blog. 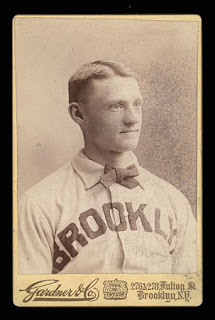 Garvey Cey Russell Lopes Blog shared some Goose Joak original Baseball cards. 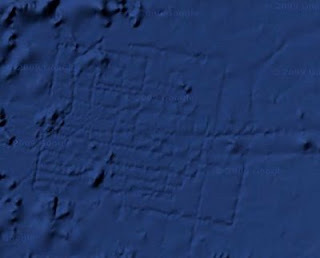 Go here to see the rest if them. Here are some other ones. The Peck & Snyder 1869 Trade Card featured on the Tonight Show with Jay Leno sold for an astounding $64,073.00. Considering it's condition I think someone overpaid. I second that! Bring back Oil Can Boyd! Ike's Cards introduces us to the photographic works of Don Hamerman. Dinged Corners discovers the 2009 Topps American Heritage Set. 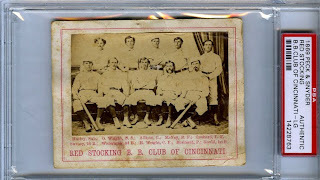 REA discovers a previously unknown variation to the N172 Baseball card set. Check out Halo Heaven's 1966 aerial photograph of Angels Stadium. 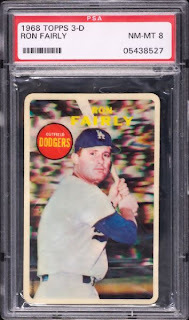 Goodwin & Co. recent auction features some very significant Dodger related Baseball cards. 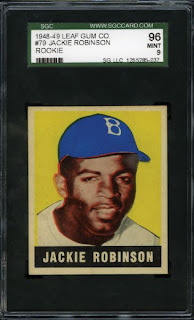 The first gem is the below Mint graded 1948-49 Leaf rookie card of Jackie Robinson. You just don't see cards looking "pack-fresh" like this. It sold for a well deserved $23,183.93. Branch Rickey is one of the great pioneers of this great game. 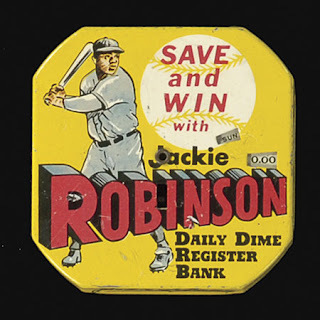 Below is a 1914 Cracker Jack card of Rickey that sold for $2,590.88. 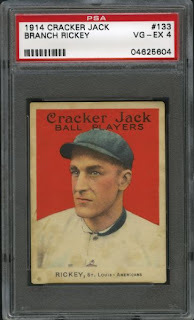 Cracker Jack cards have grown in popularity due to its scarcity and fragility. The cards are paper thin and are easily damaged. Also, mint examples feature a deep bright red background that makes the player look like he's jumping out of the card. This set is one of my favorites, and if I ever have enough dough it would be my first purchase. 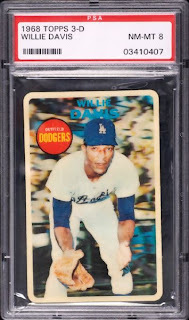 The 1968 3-D Set is one of the rarest test issues made by Topps. 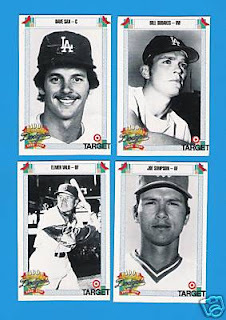 They date two years before the very popular Kellogg's sets of the 70's and feature just 12 players. The only Dodgers available were Willie Davis and Ron Fairly. The backgrounds are purposely blurred with a sharp photograph of a players portrait. The Willie Davis and Ron Fairly cards each sold for $426.53 a piece. 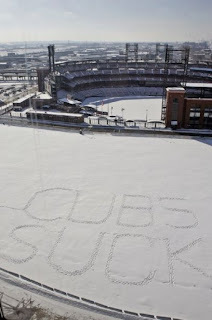 I love Baseball. It's the greatest game around. It's nice to see that back in Chicago 1922 that passion was also shared. Here is a Attendance Notice postcard found on eBay from Schurz High School inquiring about a truancy. Flora missed a week of school. Unfortunately, she got whacked pretty bad, but she seems to not care. She can't wait to get back on the bike after falling off. 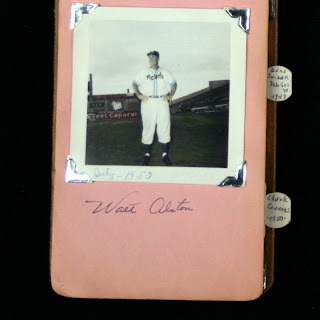 "(I) was absent because Verna Arton, by accident, hit me in the mouth with a (base)ball bat. Cut my lip open and knocked 1 (one) tooth out and (the) rest were knocked crooked." Then she follows with this. "What a feeling of rejoice(ing) to get back to play(ing) (base)ball." Rejoice! Yes, getting back to playing ball is a reason to celebrate. This video is absolutely awesome! Thanks to Robert at Vin Scully Is My Homeboy for originally posting it and special thanks to Troy for making it. It's a classic. Today is an important day for Los Angeles Dodgers history. 49 years ago today Walter O'Malley purchased the land at Chavez Ravine that would eventually become Dodger Stadium. Los Angeles Dodgers fans still flocked to see their new team at the L.A. Coliseum, but Dodgers owner Walter O'Malley had a larger vision. And on Feb. 18, 1960, O'Malley purchased land at Chavez Ravine just north of downtown Los Angeles for a reported $494,000. By that time, the San Francisco Giants -- who moved west with the Dodgers prior to the 1958 season -- were preparing to open Candlestick Park, which hosted its first game on April 12, 1960. But the patient O'Malley believed that after years of legal wrangling Chavez Ravine would be worth the wait. After two more years in the Coliseum, O'Malley proved to be right. "I Want Jeter, Not Rodriguez"
I would like to apologize in advance for my lack of blogging the past several weeks. It's just that work and the surprising play of the LA Kings has got me concentrating on things other than Baseball. Fortunately, a recent interview happened that instigated a sports collision between the bat and the puck. It is not often that Baseball and hockey collide, but this morning there was a clear crash that got me thinking about a potential blog post. Rich Hammond, writer of the "Inside the Kings" blog (Tony Jackson's peer at the Daily News) is in the midst of posting a lengthy interview he recently had with Kings GM Dean Lombardi. Lombardi was asked about the status of winger Alexander Frolov as a core member of the team, but what is a core player? Lombardi went on to define "core" as player who gives to the team more than just his stats. A core player is someone who cares about winning and being a teammate. He then adds this line. "I tell these kids, the difference between (Alex) Rodriguez and (Derek) Jeter is a huge friggin' difference. They better understand that I want Jeter, not Rodriguez." So who on the Dodgers do you consider a core member? Who do you consider to be "Jeter-like?" BTW, "Inside The Kings" is, by far, the best team blog, for any team or sport, from a mainstream news source there is. Rich Hammond is a miracle worker for information-starved fans. My apologies to Dodger Thoughts. 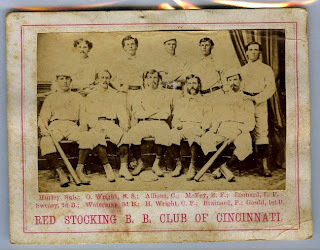 As I'm sure most of you have heard, a California couple found a rare 1869 Peck & Snyder Cincinnati Red Stockings trade card that they tried to sell on eBay. As the flurry of inquiries mounted they yanked it off the online auction house and went on a national tour to show it off; including a stop at Jay Leno's tv set. Well, they have finally consigned the card to Memory Lane Auctions and it is currently available for sale in their auction. Go here to check it out. At the time of this post it is already at $31,573.00 with over 4 days remaining. I don't like this guy one bit. "a one-year, $25 million offer Monday, according to a baseball source, a substantial departure from the two-year, $45 million offer they extended in November at the general manager meetings." He can't say he feels unloved now. Colletti has decided to bid against himself. 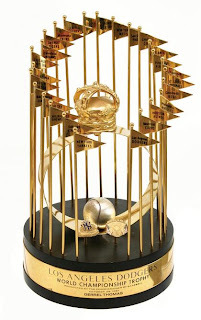 A Must Have for Any Dodger Fan! Jon Weisman, proprietor of the Dodger Thoughts blog, has just written a book that should be coming out soon. 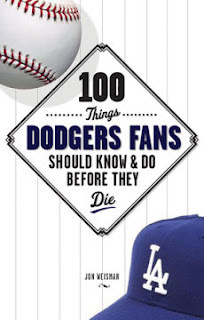 It is called "100 Things Dodgers Fans Should Know & Do Before They Die." On Saturday, February 7th check out these Baseball themed fundraisers to benefit the surviving members of the Ortega Family- they were involved in the Christmas Eve slayings in Covina. It includes a Baseball camp in Ontario and a University of La Verne alumni game in Upland. Tommy Lasorda has had a very busy Winter. Check out his blog to read all about it. Dinged Corners discovers the Dodgers 100th Anniversary Baseball card set from 1990 that was made by Target. I've been meaning to get this set for years, but, for whatever reason, have never gotten it. It consist of 1144 cards and features every player to ever wear a Dodger uniform. 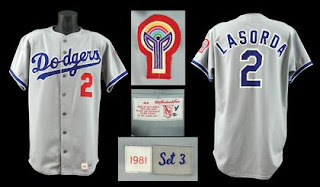 The father of Reflections of Blue reminisces about the early days of the Dodgers in Los Angeles. Go check out his vintage fan pictures from Fan Appreciation Day. Both Upper Deck and Topps lose their license to produce NBA Basketball cards. Now, Panini, an Italian company and maker of sports sticker albums, will be the lone producer of officially licensed NBA Basketball cards. This seems to be a major blow for the two American companies. Look out though, Panini may be working on making a big splash in the American collector market. The NBA have had two substantial Trading Card producers involved as their licensees over recent years but from the new 2009/10 season Panini will take worldwide responsibility for Trading Cards and Sticker Album collectibles on an Exclusive basis. In the USA Panini will create a program of activity which will focus attention on the NBA brand through an unprecedented Marketing Campaign which will re-create the domestic trading card market. To enable this strategy Panini is proud to announce that a new subsidiary business will be set up immediately entitled "Panini America, Inc". The Baseball Hall of Fame has been featuring some great items within their collection in their weekly emails. I would highly suggest getting on their mailing list. 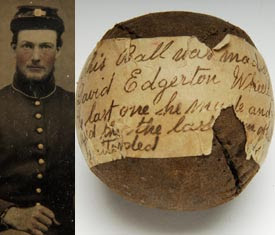 This week they tell us about a pre-Civil War homemade Baseball. J.J. idolized his brother and kept the baseball. 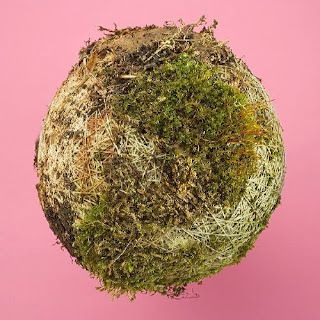 He wrote on it: "This Ball was made by David Edgerton Wheeler the last one he made and used the last term of school he attended." Hart believes the ball was made in 1859, when David finished eighth grade in his one-room country school. It is the only artifact in Hart's collection that David made. FBI is watching for autograph forgers.